I aquired 12 metal records at a yard sale several years ago, they’re from the radio show’s hosted by Gracie Allen with several guest such as George Burns and others I’m interested in more information about these their speed is 33 1/3 and in great shape on one of the sleeves written in pencil it say’s ” booked gracie allen with the date” I believe these were the masters from when they first booked her for her radio show’s? Are we going to be able to download the latest show. Been dying to listen over here! Yea man, as a courtesy to my pal at Rockin’ Radio I like to wait until he’s had a chance to hear the show first so we can post it up about the same time on our respective sites. Do you guys accept original music submissions? Actually, the PO Box has recently been discontinued. HA! It’s me again. Love this show. As soon as a new month arrives, I check EVERY morning for the download. You know, have you guys ever thought about having a similar version of the show, maybe representing the west coast? That way you could have the westcoasters broadcast in the middle of the month and you keep going on the start. I think that would be killer. I mean, not just a duplicate broadcast, but a different set of DJs with the same agenda. Just a thought. Threw it out there, my aim could be off though. HA! Thanx for checking-in Jay, glad you’re diggin’ it. You can always get us as a Podcast in the iTunes store. Then you’ll always get the show automatically when it is posted here on the site! Hi,I emailed you correctly a couple of weeks ago ,maybe less,to ask to be put on the announcements lists for when the live streams air and did not get a reply and I see you posted a new show yesterday. after she opened it, I did not notice it as a new email until over a week after you sent it. The show that I posted on Oct. 17 was aired/recorded live on Oct. 3rd, your email came in on Oct. 7th, then the delay in my seeing it, etc. So, sorry about the hold-up. But I did add your address to the email list the same day that I posted the Oct. show. You should receive an email in early November when we do our next live episode. When is your next “LIVE” Saturday show? We did a live show on Feb. 13 and March12. I’ve added your address to the email list for Live Broadcast Notifications; you should have received one for the March 12 episode. Next Live show will probably not be until May. 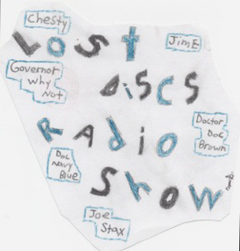 Listened to LostDiscRadio most of the way on trip to Cleveland and back. Awesome stuff. Fun. A blast. I need a sweet potato flute, man. Itchin’ to wind my way thru the archives. How bout a little “Beyond the Valley of the Dolls” soundtrack … “Find it.” “C-c-c-c-c-c-c-c-c .. Candyman.” Tell me that movie shouldn’t be in AFI’s all time list. Go ahead. Tell me. I dare you. Yea man, I will check it out asap. Thanx for the tip!